I’ve perhaps been overly concerned in my life with expected etiquette…especially in the greeting of new neighbors (this one hits close to home (harhar) as we have moved far too much). 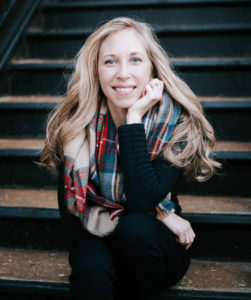 I regularly consult my etiquette book regarding life’s matters, and here is the rule of thumb for all of you who would like the Spark Notes: Treat others the way you would want to be treated. Sounds familiar, doesn’t it? Our street has recently been busy with a lot of newcomers (including us). In appropriate neighborly fashion, it was only proper to greet the newest members to the cul-de-sac with pie. And, well, ulterior motive confession: True to my hillbilly roots, I had to check out what on earth we were getting… Was it another loud, rambunctious, tricycle-riding gang, with unexplainable amounts of garbage and recycling each week (the sure description of the Gaynors)? 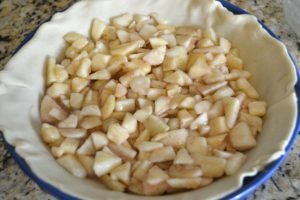 Considering our family’s tract record for moving, you’re going to need this Apple Pie Recipe in case our Tri-Tire Tribe one day comes to bring your neighborhood down a notch. Oh, and the new neighbors here are precious and have about a zillion beautiful grandchildren and an affinity for golf. They sound really wild, huh? I want to be treated with apple pie, so surely the new neighbors do… at least this apple pie! 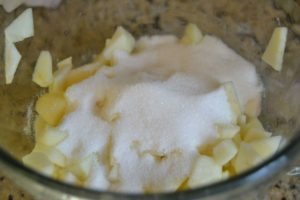 I’m used to peeling and chopping apples every day for the tots, so that’s how I prepare my apples without even thinking about pie. I know a lot of people just slice them, but the diced method seems easier for the little mouths to handle. It also provides for cutting away less than desirable pieces. 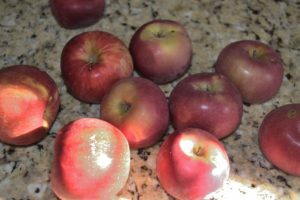 I had about 10 small-medium sized random sorts of apples that I washed, dried, peeled and diced. I ended up with about 5 cups of apples. 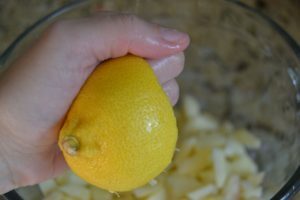 I squeezed the juice from half of a clean lemon, careful to remove any seeds that could have made it into the apple mixture (probably should’ve done this into a bowl first and then transferred it to the apples, but time is always of the essence). 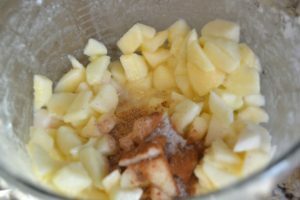 Then I stirred the juice and apples, trying to coat each apple piece with some juice to prevent browning. Add the sugar, and stir again. Add the flour, and stir yet again. Finally, add the spices and stir a final time. 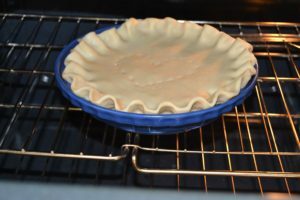 Place prepared crust into greased pie plate. Always grease it. Even if a recipe says not to. Just spread a little Pam or pour a tiny bit of canola in there and wipe it out. Pet peeve: when pie crusts stick! 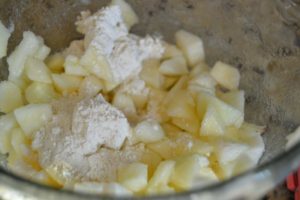 Pour apple mixture into prepared pie crust. 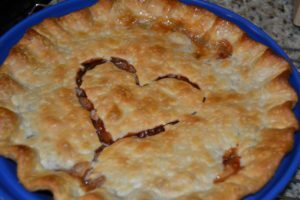 Place second pie crust on top, decorate as desired. Bake in the middle of the oven at 425degrees for approximately 4o minutes. Watch closely that the edges don’t begin to burn. If they start browning too quickly- tip: your edges may be pressed to thinly. Just cover the edges with aluminum foil and continue to bake until the main part of the crust is golden brown. Remove and place on cooling rack for a couple of hours, or dig in a little early but be sure to have some vanilla ice cream on hand. Dice clean, dry apples. Place in large mixing bowl. Add lemon juice and stir. Add sugar and stir. Add flour and stir. Add spices to bowl and stir. 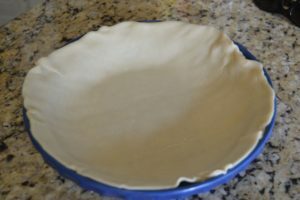 In greased 9″ pie plate, place bottom crust. 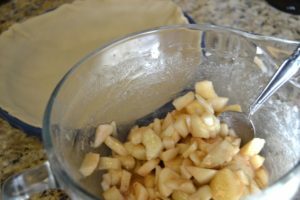 Pour apple mixture into crust. Top with 2nd crust, flute the top as desired and pierce in pattern of choice. Bake for approximately 40-45 minutes or until crust is golden brown. Place on wire cooling rack for about 2 hours to allow contents to set. Serve with vanilla ice cream or by itself. 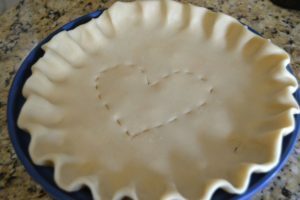 Refrigerate leftovers (if there are any! ).